The Gardens for Connoisseurs Tour showcases Atlanta’s most spectacular private gardens, from tranquil woodland settings to intimate urban spaces. Garden enthusiasts will delight in exploring the creativity and precision of talented landscape architects, garden designers and local gardeners. The Gardens for Connoisseurs Tour takes place on May 11 & 12, and all proceeds benefit the mission of the Atlanta Botanical Garden. Purchase at Garden Admissions before 7 p.m. on May 10. Online ticket sales end at midnight on May 9. Available at all Tour garden locations (cash or check only). Tour tickets can also be purchased at Select Retailers. Tickets are valid both days of the tour. Online tickets will be available for purchase on April 1. Online ticket sales end at midnight on May 9. Sales at Garden Admissions end at 7 p.m. on May 10. Online tickets purchased between April 1 – May 2 will be mailed. Online tickets purchased May 3 – May 9 will be held at Will-Call. *Children under 12 are admitted without fee. This self-guided walking tour may include some uneven or steep terrain. Tickets are valid both days. What is the latest date to purchase tickets online? Tickets are available online until Thursday, May 9 at midnight. If I purchase tickets online, how do I receive my tickets? Tickets purchased online by May 2 will be mailed. Online tickets purchased between May 3 – May 9 will be held for pick-up at the Tour’s will-call location. Where is Will-Call & when is it open? Tour Location # 2: 830 Myrtle St NE Atlanta, GA 30308 and Tour Location # 9: 2000 Garraux Road NW Atlanta, GA 30327. Tickets held at will-call are available for pick-up on Tour Days anytime from 10 a.m. – 5 p.m.
May I purchase tickets the weekend of the Tour directly at the gardens? Yes, $35 Day of Tour tickets will be available at each of the featured gardens. Cash or check only. May I purchase a ticket to see just one garden? Yes, $10 individual garden tickets are available. They may only be purchased the weekend of the Tour at the garden you wish to visit. Cash or check only. Are tickets refunded if it rains? The Tour occurs rain or shine, and tickets are non-refundable. Does “tickets are valid both days” mean I can visit a single garden multiple times? Tickets are valid both days, so you may choose to visit all the gardens on a single day or visit them over the course of two days. However, once a garden has been visited, there is no re-entry. Is my member discount available at the retailers or the weekend of the Tour? No, it is only available in advance online, at Garden Admissions or by phone 404-585-2026. The Gardens for Connoisseurs Tour is a self-guided walking tour which may include uneven or steep terrain. The Tour occurs rain or shine and there is no re-entry to gardens. Since these are private gardens, wheelchair accessibility is not guaranteed and may often be limited. We recommend dressing comfortably and appropriately for the weather. Hats, sunscreen and walking shoes are encouraged. Is there a shuttle between the gardens? No, this is a self-guided tour. Is it possible to walk or bike between the gardens? Due to the distance between gardens, we recommend driving or carpooling. Is there a Tour driving map available? Yes, click here to access the map or click “Tour map” next to the address of any of the garden descriptions. Street parking is available at or near each of the gardens. 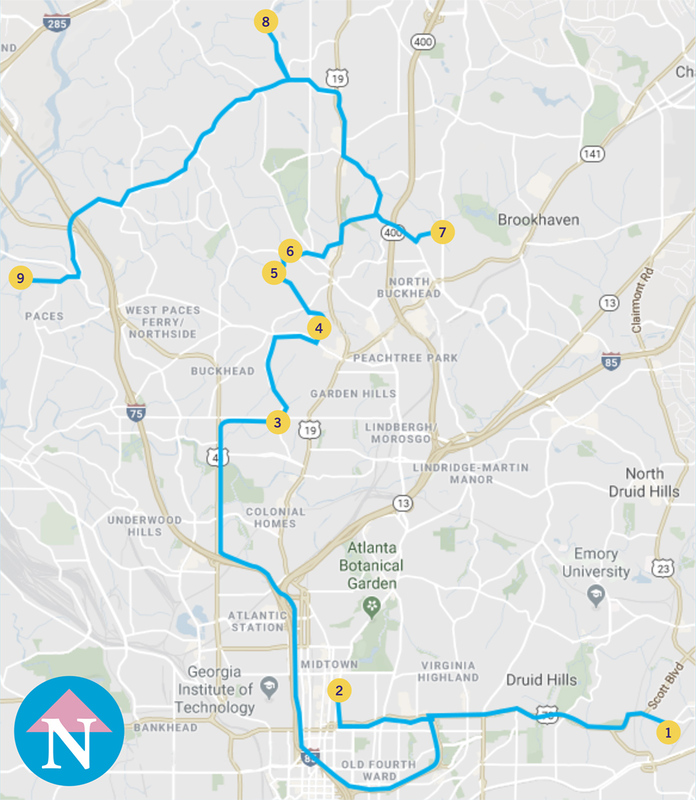 Off-site parking with shuttle service is available for garden # 3 at Ahavath Achim Synagogue at 600 Peachtree Battle Avenue, NW Atlanta GA 30327. Parking entrance for Ahavath Achim Synagogue is located at the Northside Drive entrance. The Tour occurs rain or shine. If it looks like rain, please plan accordingly. Since these are private gardens, bathrooms are not available. Please plan accordingly. May I take photographs of the gardens? Yes, photography for personal use & enjoyment is permitted. For commercial photography, please contact the Marketing Department at 404-591-1550. The $22 advance Garden member ticket is not available at retailers. In 1984 Garden Associates Founder, Peggy Martin, saw a need to gather an enthusiastic group of individuals to help grow the Garden. This collective developed into a vibrant service organization offering leadership, creative energy and support for Garden events and fundraisers like the Gardens for Connoisseurs Tour. The benefits of Associate membership include exclusive insider tours, educational programs, special events, networking and the opportunity to work with others who share a strong commitment to the Garden. 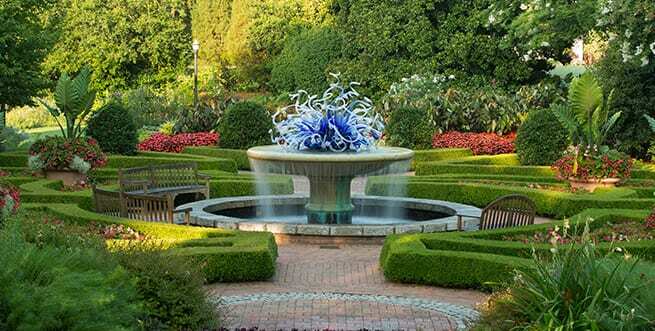 The Atlanta Botanical Garden is a non-profit organization. Tour proceeds benefit the Garden’s mission to develop and maintain plant collections for display, education, research, conservation and enjoyment. To learn more about the Garden’s stunning displays, exciting events, critical conservation work and engaging educational programs, visit atlantabg.org.